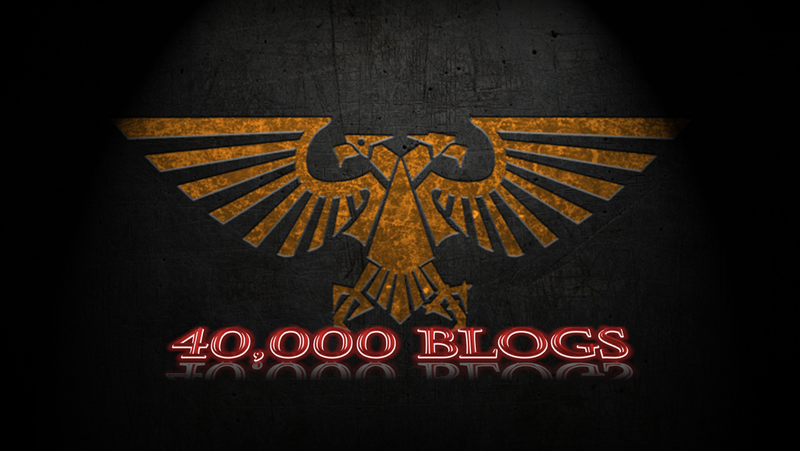 So last week we had some huge news drop in the 40k universe, the release of a new boxed set containing Black Legion and the new Primaris Vanguard Space Marines. I posted up a few initial thoughts based on the release photos but like most of us I imagine, I’ve been thinking over the weekend about what the released info means for us all and what might be coming. It’s no secret that I love the Primaris range of models, but having played them a fair few times now they certainly lack...something. Specifically in my games that has tended to be any significant capability to deal with armoured opponents (knights in particular ripped me a new one when I played them). Now yes, you can counter that by saying I just need to take more hellblasters, but I like to think of myself as a bit of a purist and I can’t imagine Roboute Guilliman being happy with just relying on Hellblasters to provide the heavy punch to whole chapters of marines created during the Ultima Founding. So it’s with this in mind that I get excited by the thought of new Primaris models (and, you know, more plastic crack!). With that in mind, I took another look at the released pictures and picked up a few extra little things I’d missed (including some blindingly obvious that I’m somewhat embarrassed to admit to!). This post therefore is a logical extension of my previous comments on the matter, but extend beyond simple looking at the photos to try and figure out where the release is taking the faction in the future. There are a few other telling parts of this artwork that I’m afraid I missed in my last post (apologies, I was sleep deprived and hadn’t had much time to think on things before cobbling the post together to release on Friday). The guy in front of him is a Primaris Lieutenant (I know!). I’d previously suggested this might be a combat type Primaris unit, but somehow I’d missed that the rank badge on his right shoulder guard is quite clearly that of a Lieutenant (according to the Ultramarines Transfer Sheet that comes with Intercessor squads anyway). That explains the sword in his hand, though there’s slightly more to this than I’d first thought as well. The bolt weapon in his other hand is of a previously unseen type, it has some kind of scope/designator attached to it but not of a type we’ve seen on the Bolt Rifles carried by intercessors etc. He’s also wearing the Phobos (Reiver) pattern armour, including a Grav Chute! That’s something very new and to my mind, very significant! One of the biggest issues I have with my current Primaris force is dropping in my big unit of Plasma Inceptors but not wanting to overcharge them because they’re rarely anywhere near my Captain. If this Lieutenant is able to deploy via grav chute insertion, then surely it’s a logical step that Vanguard Captains (I’m pretty sure at this point that what we’re seeing is an all-new Vanguard force for Primaris, a distinctly different force to the traditional battle company type army we’ve seen so far, which in fairness GW all but confirmed in their article) will also be able to deploy in this way (I know, we’ve not seen a Vanguard Captain yet and the article noted that Librarians lead such forces, but it also specifically noted that they sometimes lead Vanguard forces, leaving the option open for more typical Commanders to come forward). That would make a huge improvement to the viability of several Primaris options, with mobility being one of their main issues at present. There’s also a shadowy object concealed up in the upper parts of the image that I can’t make out (just below the Community text), but doesn’t appear to be part of the structure, and several figures in blue that I’m assuming(!) are Exterminators. And finally, sat immediately next to the Librarian’s shoulder pad (on the left as we look at the picture) is a blue shape. Can’t make out too much, except that it’s far more angular than any of the armour pieces we’ve seen on the Vanguard so far, and appears to have a battleline white arrow painted on it. Now it’s a stretch, but could it be the rumoured Primaris Transport/Skimmer? I also posted up about the unit types revealed so far, postulating that we might be seeing in the box a Primaris Troop unit to give choices other than Intercessors. The other major thing that I missed (sorry!) 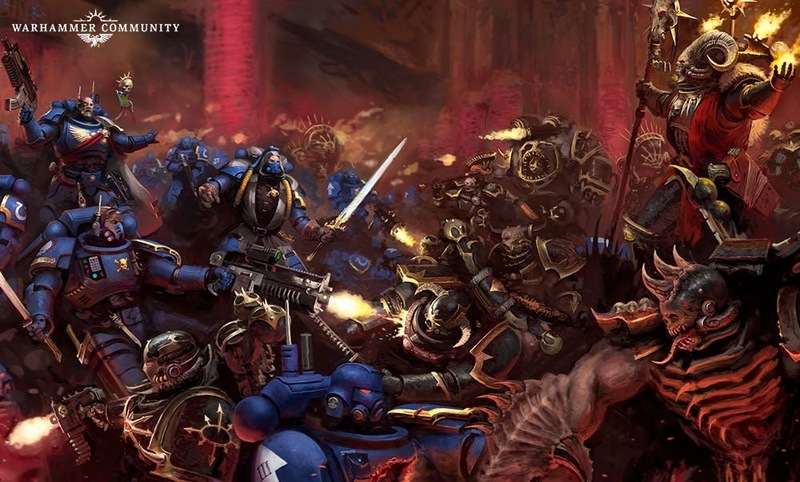 is that the guy in the foreground of the picture is wearing a very obvious battleline unit marking on his shoulder pad (as are the majority of the units we can make out in the artwork). Reivers wear close support unit designations so regardless of anything else we might have seen, what we are seeing here is a new ‘Troops’ type unit wearing Phobos (Reiver) pattern armour. That then supports my theory about their guns - because the guns we can see in the artwork don’t reflect existing patterns of bolt weapon either. I’m reaching here, and drawing conclusions from stuff but bear with me. I think that the Vanguard will be a new type of battle company, possibly replacing one of the reserve companies (formerly the assault company perhaps?) rather than a battle company, so we could be seeing some drastic changes to a chapter’s organisation coming (the logical extension of that being that if we’re seeing essentially a close support company structure, that a fire support structure will also follow). I don’t think the Vanguard replace the Scout Company, because there’s no indication they are not full battle brothers, and they wear full power armour (which scouts aren’t capable of). These Vanguard Companies will all wear the more stealthy Phobos type power armour, and it may also be that Reivers sit more within the Vanguard ranks than the more conventional Intercessor/Aggressor/Hellblaster ranks we’ve seen so far. They certainly fit with that stealthy, fighting dirty image that GW have set out for the Vanguard. So the next question then, is will the Shadowspear box include a close support unit for the conventional Primaris forces? I’d say no, but it’s conceivable that such a unit might follow on soon after, since Reivers were released shortly after the Dark Imperium box. Looking even further ahead, we have so far seen three types of Mark X power armour released upon the world. Tacticus Armour we know is worn by Intercessors (battleline) and Hellblasters (fire support). Gravis Armour by Aggressors (fire support) and Inceptors (close support). Phobos Armour by Reivers (close support), and now we know this new Vanguard battleline unit, along with Exterminators (fire support?). The other thing we’re missing is any specific veteran units for Primaris forces! We can make Veteran Intercessors through the Indomitus Crusaders detachment in Vigilus Defiant, but how about other veteran units? What if these three patterns of armour are in fact, Company defining? Might we see in the future Tacticus Company, Gravis Company and Phobos Company designations? Presumably there would be tactical flexibility between these to incorporate units in other armour types but the companies could be defined by the armour type of their battleline squads - might we see in the future a space marine troops unit in Gravis armour? Perhaps wielding a lighter version of the boltstorm gauntlets worn by aggressors (paired bolt rifles)? Ok I’m very much into the realm of speculation at this point, but you heard it here first, and I wouldn’t be at all surprised based on what we’ve seen if the range truly does evolve in this fashion! What do you guys think? Am I in the realms of fantasy or does my logic and reasoning lead you to the same conclusions? And more to the point, what’s that shadowy thing in the picture??? Getting Primaris Characters who aren't stuck footslogging would be a huge deal right there. An affordable APC and a reasonably-priced dedicated battle Tank instead of only the Repulsor would be my next hope. I couldn't agree more - there's currently a real lack of mobility with the army, unless you flood the board with Inceptors (which can work if you mix them with oldmarine jump pack characters) that doesn't make sense. Similarly yes, a main battle tank would be awesome, and if you drop the transport capacity of the Repulsor I don't see why it couldn't be cheaper too, I still think the Repulsor is a little overpriced for what it brings to the table, even if you factor in the transport potential. 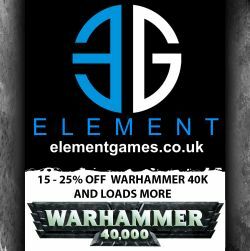 GW almost always overprices multi-role Units. It's been a problem with Land Raiders for pretty much the entire history of the Game. Very true, I think a few of the Primaris Units struggle with their costing to be honest, Plasma Inceptors are good but are hideously expensive for what they do, especially when you consider their resilience in return, and Reivers (especially if they're kitted with grav chutes and grapnels) just don't stack up in terms of damage output. The spider thing was an Easter Egg in previous artwork, so I bet you are spot on with the Transport option 'Primaris Rhino' in the top left. As for mobility, a Primaris 'jump captain' will make perfect sense and those who wish to field one at the moment have to resort to include an old-marine Jump Character with their Primaris force, so with the eventual end of old-marines looming (sad face) this would make prefect sense. I agree. If they're bringing it in by means of a grav chute it wouldn't be quite so mobile as a genuine jump captain unit as grav chutes are a deployment only ability rather than increasing their in-game movement, but it would still be a big improvement and would combine really well with Inceptors. Interesting break down the theories. Cheers for sharing. Did Astartes just grow up a little?